The water left after soaking dried black beans is a fantastic natural colorant, creating hues that range from dark blues and teals to steel grays, pinks, and purple, depending on the mordants used and the pH modifier added to adjust the color range. 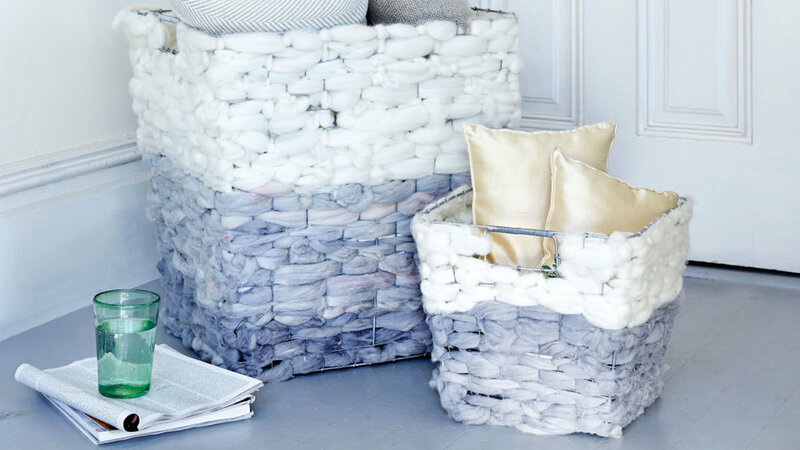 For this project, I wove dyed wool roving through wire mesh baskets—making for both an easy weaving project and beautiful storage baskets for all your plant-dyed textiles. I’ve found that beluga lentils also work well in place of black beans. Important Note: Dyeing unspun wool must be done carefully at a temperature that gradually rises and gradually cools to avoid matting and felting the soft wool roving. With clean, prescoured wool roving (make sure you have already purchased scoured roving), premordant 1 pound of the wool with aluminum sulfate and cream of tartar, if using. Add the black bean water to a large stainless steel pot two-thirds full of water. Add the wool to the bath and raise the temperature gradually. Simmer on low for 20 to 40 minutes. You can turn off the heat and let the wool steep until it reaches room temperature, or even overnight. Remove the wool and lay it flat to dry out of direct sunlight. Add the iron powder to a pot of lukewarm water as an after-mordant. Divide the dyed wool into thirds. Add one-third to the after-mordant. The color will turn a darker blue or purple. Add the soda ash to a pot of lukewarm water as an after-mordant. Add another one-third of the dyed wool. The color will turn a darker blue-green. Rinse the wool in lukewarm water and pH-neutral soap—do not wring the fiber or agitate it, as the wool will felt. Let the wool dry out of direct sunlight. When fully dry, weave the three colors of wool roving in and out of the base of the baskets, creating a color change per base of each basket. Add the remaining 1 pound of undyed white wool roving around the basket rims to create a color contrast.